Fiber cement siding has been growing in popularity over the past several years as an alternative to traditional wood siding. The beauty of fiber cement siding is that it looks like natural wood siding, but does not require the maintenance of traditional wood siding. Fiber cement siding is constructed from a mixture of cement, cellulose fiber and sand. After being rolled out and pressed with various woodgrain finishes it is baked to form a strong and durable home siding product. The fiber cement siding manufacturers also prime the siding before shipment. 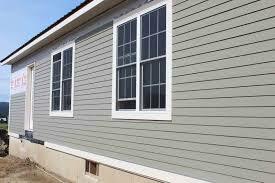 Fiber cement siding manufacturers offer a variety of siding products. They produce standard lap siding, as well as soffits, fasica, panels, shingles and trim boards. One of the key benefits of fiber cement siding is that does not decay, rot or swell. It is an extremely stable product that can withstand the effects of cold winters and hot summers. Consequently it holds paint well and is extremely low maintenance. Many fiber cement siding manufacturers offer warranties of 50 years against product failure or manufacturing defects. The one down side of fiber cement siding is that it is quite heavy. As a result, special care needs to be made in transporting and carrying it so that it won’t break or become damaged. For example, lap siding comes in long strips that needs to be held on it’s side, and supported in the middle, when carrying it to prevent sagging and breakage. From a cost perspective, fiber cement siding is cheaper than natural wood siding, but more expensive than vinyl siding; a small price to pay to avoid having a home that shines like a sheet of plastic. 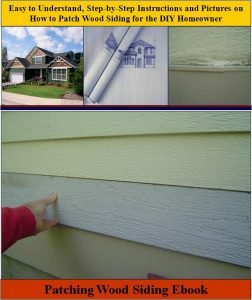 Installation of fiber cement siding can be performed by the do it yourself homeowner. As a matter of fact, manufacturers have specifically designed it so that homeowners can indeed install it themselves. This said, it is heavy and does require some basic carpentry skills. In addition, the manufacturers provide important instructions for proper installation that the homeowner should read first prior to installing the fiber cement siding. Recommendations include taking precautions to minimize dust exposure, by wearing a protective dust mask and cutting the siding outside with certain types of saw blades and cutting equipment. Note that the fiber cement siding contains sand which can be hazardous to breath in. Like natural wood siding, fiber cement siding is installed with hammer and nails, or a nail gun. It can be blind-nailed, where the piece above it hides the nails below it, or it can be face nailed for extra strength. After installing the fiber cement siding to the home an acrylic paint can be applied directly to it. Typically only one coat of paint is all that is required since the siding comes pre-primed. Fiber cement siding is a great alternative to wood and vinyl siding products. It has the look and quality of natural wood siding, without the maintenance or the worries of rot, or weathering. And unlike vinyl, it has the curb appeal of wood siding with the strength to withstand hurricane force winds. From a price perspective, it is well worth the premium over vinyl and worth the cost savings over natural wood siding. Visit your local home improvement store to learn more about this product.